Do you remember being 6-years old? Did you ever have that dream that you had a pet dinosaur? I remember 6-year-old me. I used to imagine dinosaurs running alongside the car on long road trips, or even just the drive across town to the local Walmart. If I squinted, I could almost see them. If you’re a kid (or kid at heart) who’s ever dreamed of having a pet dinosaur, then you’re at the right place. If you’re not really into the whole dinosaur thing, but your child, niece, nephew, kid-down-the-street is…then you might want to hang around anyway. So what’s exactly going on here? The short version? 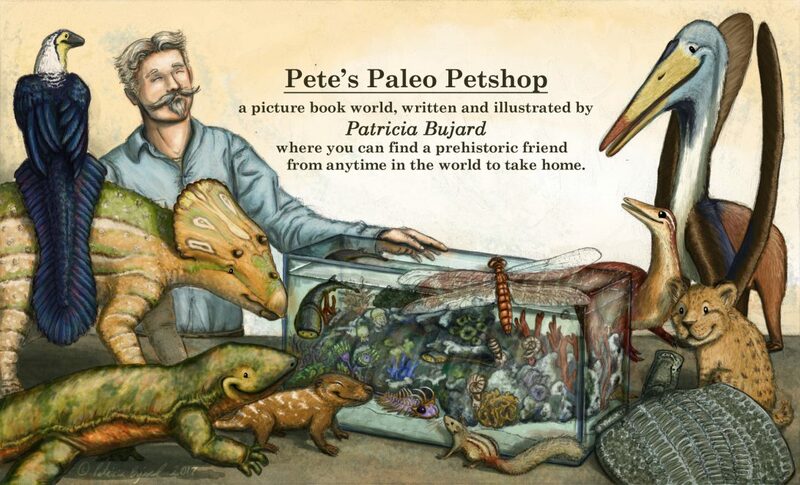 This is the official website for a children’s picture book series set in Pete’s Paleo Petshop, a fictional place where people can meet a prehistoric friend to take home. I’m both writer and illustrator, and I try to illustrate the dinosaurs and other prehistoric animals as accurately as possible with the latest scientific papers (while still being cute). The website will be a way to receive updates on my progress on the books, get behind-the-scenes goodies, and generally have fun with the world. As a dinosaur-loving kid I would’ve loved the chance to have a pet dinosaur, so this is the next best thing. 🙂 As a reader, I always love really immersing myself into that world, and I hope to give you that same experience. Pete’s Paleo Petshop, where you can meet a prehistoric friend to take home. The first book in the series we’ll meet Danny and his family on their way to Pete’s shop, where they hope to find a quiet, little dinosaur. Not easy to find in an age of giants! This book will have animals from the Jurassic period, the “golden age” of dinosaurs. We get a lot of famous giants during this time, like the long-necked Brachiosaurus and Diplodocus, the meat-eating Allosaurus, and the spike-tailed Stegosaurus. But there are many other animals that usually get overlooked. Ok, ok, let’s pause a second. I know what you’re thinking. No, you won’t have to be trying to pronounce those names all the time. It can be a real headache to sound out Castarocauda for the 20th night in a row. My parents must have incredible patience, because we had a dinosaur book that all the critters where labeled on the page…I’m sure they wanted to chuck the book out the window on more than one occasion. No, here at the shop the kids give the critters names like Steggy, Cassie, and Alfred. All formal names will be at the back of the book, or perhaps here on the site. This is where it gets fun for you as readers, teachers, and parents. Since I’m in the creation phase, there are lots of opportunities for you to have a say in how things get done. You can vote on critter color patterns, book covers, make species cameo suggestions…even choose a favorite from say…fancy feathery feet on some prehistoric bird? Domestic chickens have all sorts of cool feather styles, and I’ll be illustrating similar changes on a few of our “domesticated” critters. If you want more, here are a few places you can visit.